Taking your kids out to eat tends to get a bad rap and in reality, it can actually be very beneficial for you and your children to go out to a restaurant as a family to dine. 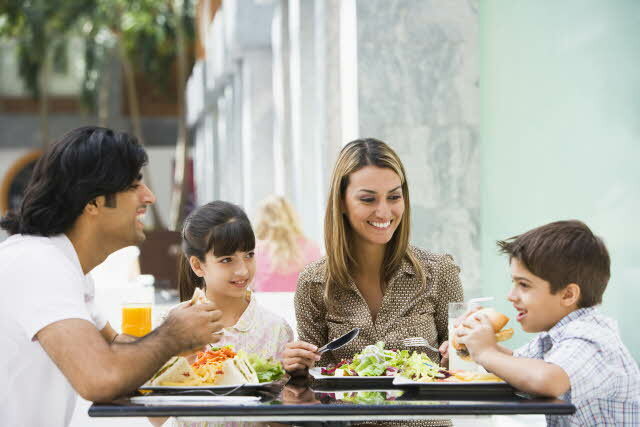 Here are five benefits to dining out with your children. Some parents struggle with picky eaters and children that just refuse to try new foods at home. What is good about taking them out to eat, is that it gives them the opportunity to choose something new that they will most likely love and hence giving you a better idea of what to prepare more often at home. If they refuse to order something from the restaurant then see if they will at least share a few bites with you from your meal. With all the hustle and bustle of life, it can be difficult at times to pull the family together to et at the dinner table. Dining out at a restaurant can be less distracting since there aren’t pets, Tv’s, toys and other things that will draw your little ones attention away from not only their food, but from the family as well. Some families like to make dining out a weekly tradition which is a great idea! However, if you are looking to conserve money, you can use it as a way to celebrate your little ones victories! Taking them out for a yummy meal, or even just ice cream when they accomplish something is a great reward as well as a wonderful way to spend some extra time bonding. Every child needs to learn how to act appropriately in social environments, and restaurants are a good practice ground for them to learn quiet skills, manners, and how to behave in social situations. Usually when you go out to eat as a family, you will end up being in the restaurant longer than you would if you were to dine at home. This means that conversations will last longer and give you more opportunity to get to know more about what is going on in your child’s life or mind. Some Favorites To Try From Our Menu!